This dress runs true to size (see following fit notes for exceptions). LENGTH: Floor length - Two lengths available. Regular measures 58'' from shoulder to hem (recommended for heights 5'1''-5'6'') and long measures 61'' from shoulder to hem(recommended for heights 5'6''-5'11''. 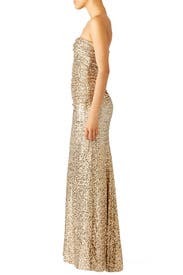 Gold sequins(100% nylon). Strapless neckline. Ruched bodice. Hook-and-eye closure. Hidden back zip. Imported. See size and fit tab for length. I got so many compliments on this dress! 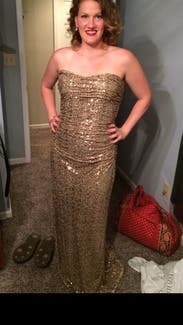 It fit beautifully, wasn't heavy even with all the gorgeous sequins, and was just a phenomenal gown. For comparison, I'm currently around 115lbs, 5'8, and hourglass figure. I got the 2L & 4L and didn't even try on the 4. I'm small around up top so I was just happy the 2 fit. 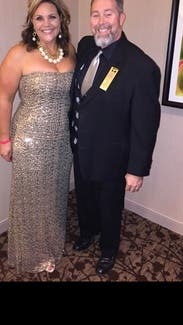 I was able to get away with about 2.5 inch heels but 4 probably would have been best, just didn't want to tower over my handsome hubby! Will definitely rent again! On time delivery, great service. The gold! The sequins! Omg I stood out for all the right reasons in this dress! This dress was amazing! 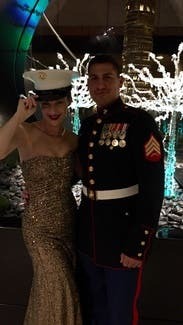 Perfect for a military ball. So many girls in red, I was the only one in gold. I wore it with a bustier, which helped everything stay in place. It has boning, so you may not need it, but it helped my girls stay in place. It def runs short. I'm 5'6 and so glad I got the long. I wore it with 3.5" heels and it just dusted the floor. Perfect! 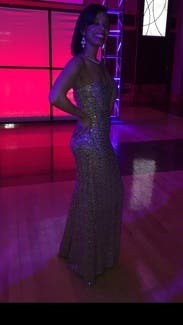 This dress was PERFECT, I wore it for a homecoming queen candidate dress and the lights from the inside of the gym, football field and sunlight reflected off of it perfectly. This dress photographed great and looked even better in person. I got complements on my dress all day and night. I wore the dress for 14 hours so by night the dress was a little loser than it was in the morning. 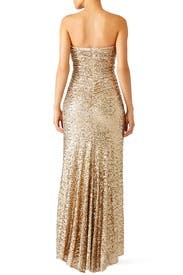 Overall the dress fit great, flatters curves and appeared to be very thinning. The length of the 0R was perfect for my 5'5" height to wear flats or a small heal but I chose to go barefoot. 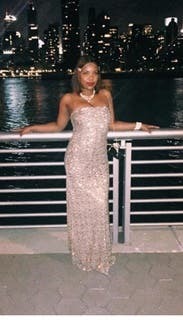 This was my first time renting from RTR and my experience was fabulous, their service was great and I got my dress two days before my event, and had the perfect amount of time to ship it back. 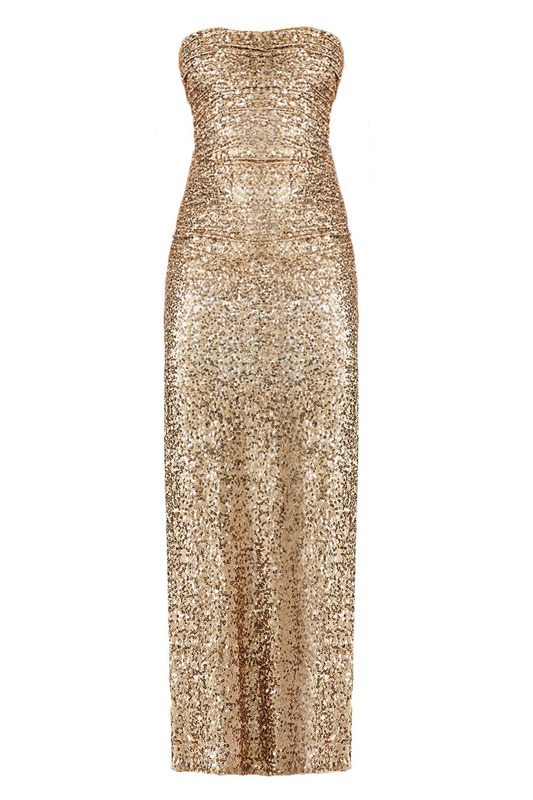 I highly recommend this dress for anyone who is looking for a long, sparkly gown. It was a fantastic dress. Better quality of a dress than I was expecting. The fit was snug but solid. By he sequins under your arms rub the under side of your arm but I got over it. Ordered another dress and it was too long. This one came and saved the day! 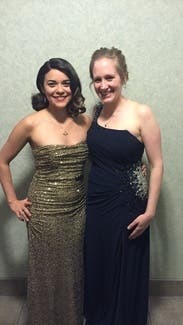 Wore it to a military ball. Absolutely loved it! Had ordered another dress, didn't like the fit so i ordered this last minute and it was perfect! Beautiful dress. The gold color is awesome. It's definitely long enough for me, and I'm 5'9". Only flaw is that the dress doesn't have a lot of structure in the top so I had to pull it up from time to time. Beautiful color. 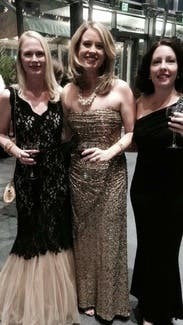 Wore for a "gilded" themed NYE affair. Paired with a lulu frost cuff & Kate spade necklace, all from RTR. Show stopper. Fit great. Train requires heels & attention, but worth it. Alex's Lemonade Lemon Ball was certainly not sour! I LOVED this dress. I've rented from RTR several times and this was the best one yet! I got so many compliments the entire night. It was really tight when I zipped it up, but once it was on it fit like a glove. The sequins under my armpit killed by the end of the night. But it was worth the pain! The length was perfect with a 6 regular and I wore fairly high heals. Don't need too much jewelry. This one shines all in its own!! Keeping this one on my short list! I'm not usually into sequins and sparkle... 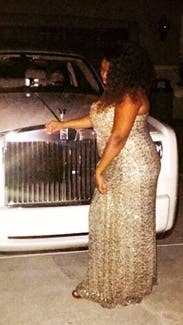 But rented this for a formal NyE party and fell in love! The dress fit amazing and photographed amazing! Got so many compliments all night long! The only negative is I have sensitive skin so the sequins running against my upper arm started to irritate my skin. Prob not a problem for everyone- but just a heads up! Didn't effect my love of this rental at all!!!! 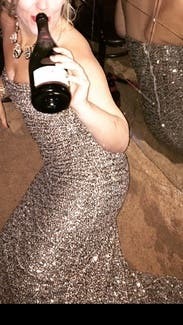 Might even rent this same dress again... Several girls at party used RTR and we all raved about RTR all night long! Fit great! Very stretchy I went up a size to accommodate my breast size. Very comfortable and not too heavy! The ease of finding the dress was awesome! Rent & return save $ look beautiful sounds great to me! 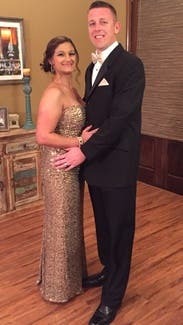 I rented this for a Mardi Gras ball and absolutely loved it! I felt like a princess and received so many compliments from friends & total strangers! Highly recommend spanx so boning doesn't aggravate you. Dress fits true to size and is beautiful -if ur thinking about it just get it promise it'll be worth it! Lovely dress, fits very well n is light. 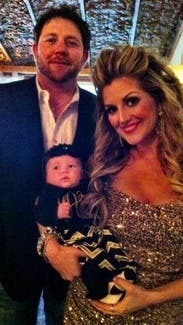 It was a little long but other than that great dress! 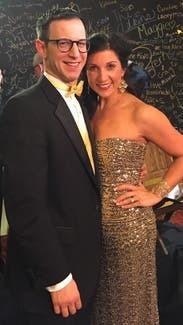 I wore this dress to the Endymion Extravaganza during Mardi Gras. The dress looked amazing! The 2R fit perfect. It was very flattering. 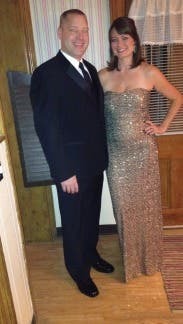 My back up size 4P would have worked as well except it was a little short with my 3" heels. My main concern was length because I'm only 5'3 but the regular length was just fine with my heels. Overall I was very pleased with my experience with Rent the Runway. This was my first time renting and the process was very easy and I would definitely rent again. 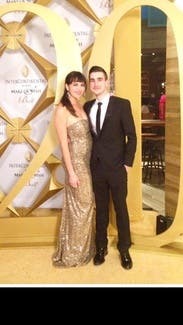 Fit was great and dress was gorgeous- only problem was it was itchy under the arms but worth it! 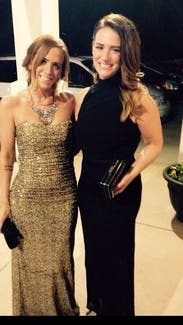 This dress was sent when my original 2 dresses didn't fit for my role as a bridesmaid in a NYE wedding. 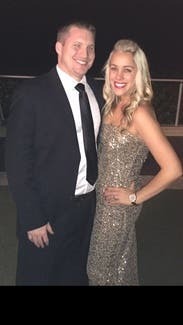 It was beautiful and would have worked out fine, I was 27 weeks pregnant at the time of the event, 5'3" and 125 lbs and a 34c/d for reference. I wound up wearing the Badgely Mischka award winner gown in a 6r instead of this one and would highly recommend it for other preggo ladies. The gown was absolutely beautiful and made heads turn to look at it! I ordered the 4 because the reviews all said the bust was too big, I should have ordered the 6 because it would have fit perfect in the bust size, the 4 was fine, but it was too tight in my bust. I loved that there was a little gifts that came with the dress. It added to the overall experience!! The fit was perfect. After trying on I wish I would have rented the 14L so that my shoes and feet wouldn't show. But the 14R turned out to be just right. I didn't have to worry about it dragging on the floor or anyone stepping on it. The statement necklace I wore really helped to make the dress pop out even more! Received many compliments on the style and fit of dress!!! Great dress! RTR has amazing products! The dress had some stretch and was so light weight and comfortable. I didn't want to take it off! 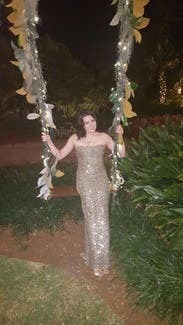 I'm shorter and I never thought I could wear a long dress but I'm amazed at how well it fit and I just wore shorter heals and had no problem with the dress being too long. This was my first RTR experience and I was not disappointed! Overall a great experience! This dress is perfect! It really hugs all of the right places and hides any of the problem areas. Super flattering. Both sizes fit but I chose to go with the smaller size because the top felt more secure. The color is beautiful and the dress seemed to be in great condition. Loved this dress! Great dress for my prom! Got lots of compliments all night. A little heavy but tape helped keep it up. Would recommend this dress to anyone looking for something to catch eyes! I wear a 4-5. I could barely zip the 6. Dress is also heavy and scratchy, but overall I loved it! I felt Amazing in it and got a lot of compliments. I felt like a star! 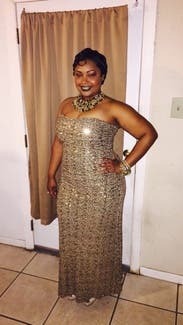 I was very pleased when the dress came in a day earlier than expected since I was wearing this to my senior prom and was anxious about the fit. The 0p fit perfectly with my heels but was still a little long in the back with the mini train it has. I loved how the top is form fitting which allowed it hug and show off my small curves. The only thing that I did struggle with throughout the night was pulling up the top. I was dancing and I found myself constantly pulling it up. Other than that I absolutely loved the dress and received so many compliments! RTR got me this overnight and it got here just in time for my gala! Fit great, comfortable, stayed up I wasn't tugging at it like I thought I might. The 8L was really long for me , I'm 5-7". I had to go out and buy 5" heels and still held it up to walk. But look how beautifully it puddles on the floor! . 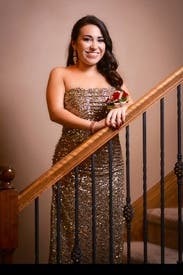 I never wear strapless and this was gorgeous, I was complimented all night! Had this sent as an emergency replacement since original picks were damaged. So glad that happened since this was a showstopper!! 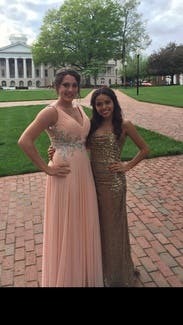 Received tons of compliments and also had to wear 4" heels due to length - being 5'11" and having a long dress is a HUGE DEAL!!!! Love love love!! I'm normally a 6, but the 4 for was much more flattering. The 6 was baggy and hung awkwardly, and even the 4 was pretty loose by the end of the night. I'd recommend ordering a size down for your second dress. Dress fit fairly well and looked amazing! It was a perfect length even with heels. I am in between sizes and kind of wish I wore the smaller one as by the end of the night of dancing the top was a bit too big. 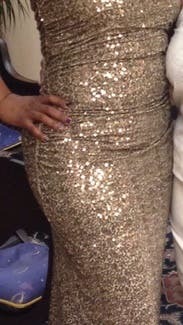 Over all I enjoyed the dress, hit any midsection imperfection well. Plus side my dress arrived early so I extra time to find the right accessories! Dress was true to size. It fits every curve of your body. I'm a 32b and it smashed my breast a little making them look smaller. I had no problem with the dress not staying up. I read in other reviews that they had to keep the dress up. It was a perfect fit for me. Zipper a little hard to zip. I loved this dress and received so many compliments. I wore 3inch heels so the dress wouldn't drag. Shipping was fast and on time!!! Will definitely order from RTR again!! Fits like a glove!!! 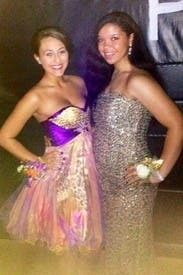 I received so many compliments all night long and was told I had the best dress at prom! 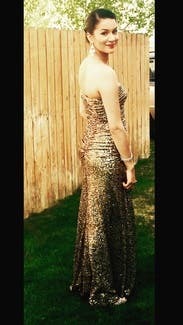 I wore this dress to my prom and I felt so beautiful in it, such a gorgeous glitzy dress! 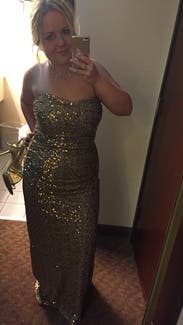 It was a little loose up top but it held well, length wise was perfect with heels and was a decently comfortable dress, very slimming and flattering. The sequins were a bit scratchy under my arms when they were resting there but everywhere else was not itchy at all! Perfect dress for the perfect evening! I had originally ordered another dress from RTR, but it was too short. I emailed the help line and within an hour (even after the office was closed!) I got a response from a stylist who helped me find another dress to get there in time. 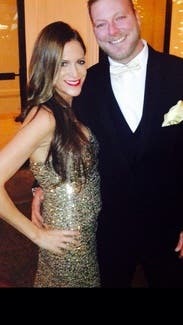 This dress got there the morning of my event and could not have been more perfect! The length (long) was great with heels and didn't drag on the ground too much . 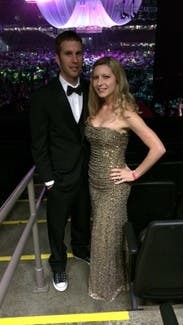 I got so many complements on my dress and people kept telling me I looked like I was on the red carpet! One thing to keep in mind is that the bust area was a little tight (I'm a D cup so it might just be me) so get a thinner strapless bra if you need one at all. Overall, RTR and Bagley Mishka did it again-- fabulously! 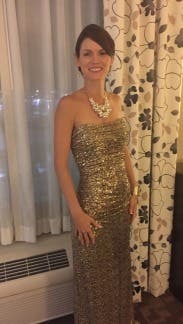 I wore this for my 40th BDAY party and it nailed the look and fit I wanted for the night! Glamorous! Super glam, snug fit, itchy on your arms but instant runway look achieved!!! Wore this to a wedding! I loved the color and felt like a star the whole night. I ordered a 4 and a 2. The 4 was baggy on my waist but the 2 was a little scratchy under my arms. Overall I loved it. The fit was perfect and i couldn't have asked for a better fit. 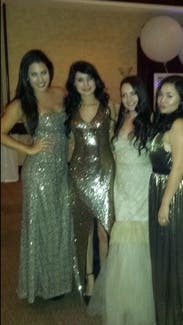 I felt like such a princess and everyone thought my gown was gorgeous. I kept getting compliments. There is a small train at the bottom of it, so if you have to take pictures outside careful not to run it through too much dirt. The sequins pick up everything. 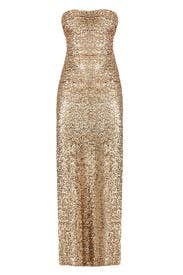 The only negative thing about the dress is the sequins scratch your arms and right under your arm pits. It makes it a bit uncomfortable after a few hours. Overall, I would absolutely rent this again. I loved it. Amazing dress. It was pretty tight getting it on, but loosened throughout the night. The drawback was the sequins ended up cutting up my arm. I was able to wear this to a formal event and again the next night with a t-shirt over it. I am 5'1 and wore short heels and the petite worked great. If you are much taller or wanted to wear taller heels, I would probably get the regular length. 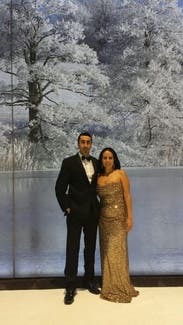 I was able to wear my first couture gown ever ! Great customer service from Stylist Samantha ! 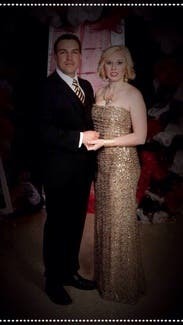 I used this for James Bond themed event. It's was PERFECT! Fit like a glove. I never wanted to take it off.